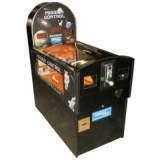 Coin-op Redemption Game published 12 years ago by American Alpha, Inc.
Mission Control © 2007 American Alpha. Player aims the coin across Mars towards the hatch. Even if the coin falls off the track into any of the 6 craters, the player still wins tickets. If the coin rolls into the hatch, the player wins even more tickets. 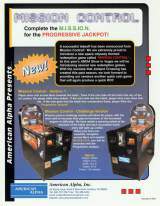 If the coin goes into the hatch 4 consecutive times, the player wins the Progressive Jackpot!